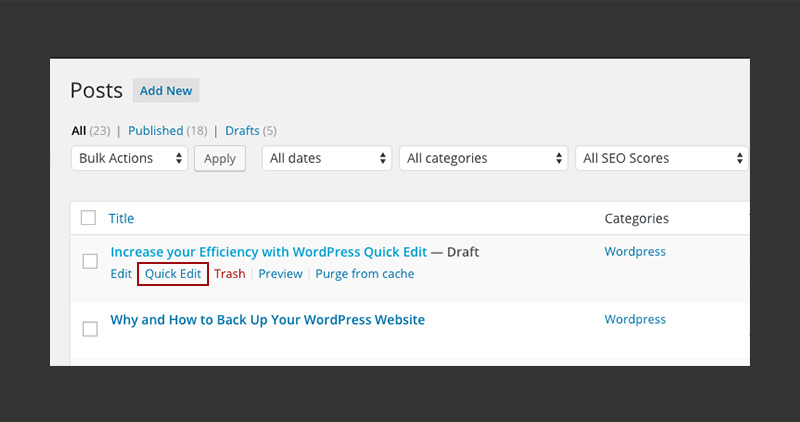 WordPress has a ton of handy features that help you spend less time managing your website. That’s more time doing the work that you love. 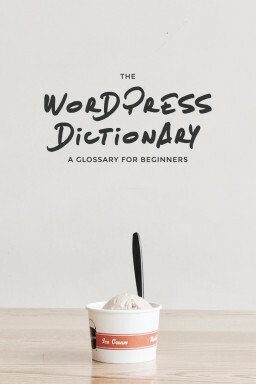 I could wax poetic on the ways in which I love WordPress, but I’ll save you the time and myself the embarrassment. 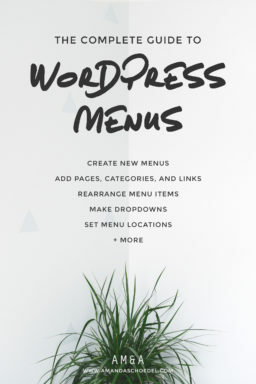 I have a lot of favorite tips for maximizing WordPress. If I had to pick just one, though. One that I couldn’t live without. Well, it would probably be the quick edit tool. WordPress quick edit is an easy way to make basic changes to posts or pages without opening the full editor. This is useful when you want to make minor adjustments, like adding a category to a post or changing the slug of page. I make a point to introduce the quick edit feature to all my clients. I’m always surprised by how many of them have never heard of quick edit. 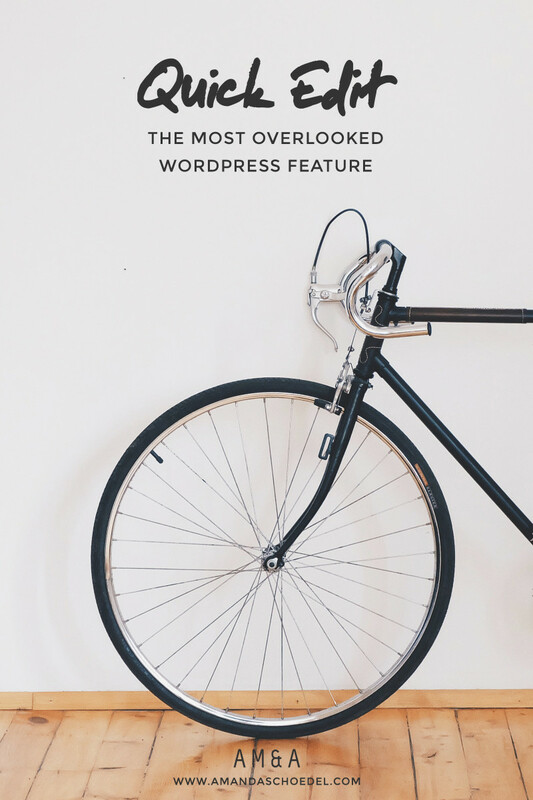 Even the ones who have been using WordPress for a while are often surprised. This just goes to show you, there are always new tricks to learn. This is one worth learning. Make your way to Posts > All Posts. If you’ve been using WordPress for a while, you should be familiar with this screen. Normally, you’d click on a post title to open the editor. Instead, hover over the title. Several links will appear beneath the post title: edit, quick edit, trash, and preview. 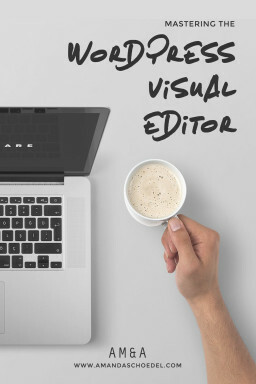 Click on Quick Edit to expand the quick editor. Title — Edit the post title. Slug — Edit the post slug. Date — Edit the post date. Password — Add a password to a post, change an existing password, or make a post private. Categories — Use the checkboxes to add or remove categories from a post. Tags — Add or remove tags from a post. You can type tags directly into this field. Just be sure to separate tags with a comma. Comments — Check the box to allow comments. Uncheck to disallow comments. Pings — Check the box to allow pings. Uncheck to disallow pings. Author — Change the author of a post. You will not see this field if your website only has one user. Status — Change a post from draft to published or pending review. Sticky — Check the box to make a post sticky. Sticky posts stay at the top of your blog page, even when new posts are published. When you’re done editing, click Update. If you change your mind and want to abort a quick edit without making any changes, just click Cancel instead. Editing pages is almost identical to editing posts with quick edit. The only difference: some of the options for pages are different than the options for posts. You’ll get there by selecting Pages > All Pages. Hover on the title of a page, then select Quick Edit. Title — Edit the page title. Slug — Edit the page slug. Password — Add a password to a page, change an existing password, or make a page private. Parent — Assign a parent page. Remember, pages are hierarchical, so you can nest them within each other. Order — Change the order number of a page. Template — Change the template that a page uses. Comments — Check the box to allow comments. Uncheck to disallow comments. Generally you would not want to allow commenting on a page, so you can leave this unchecked in most cases. Status — Change a page from draft to published or pending review. Remember, nothing saves until you click Update. 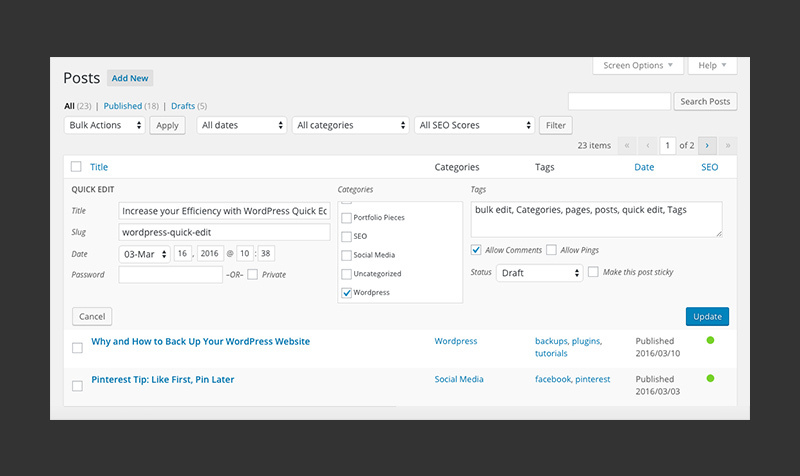 The WordPress quick edit tool is for quick editing (hence the name). This means you won’t have every feature available to you that you have within the full editor. 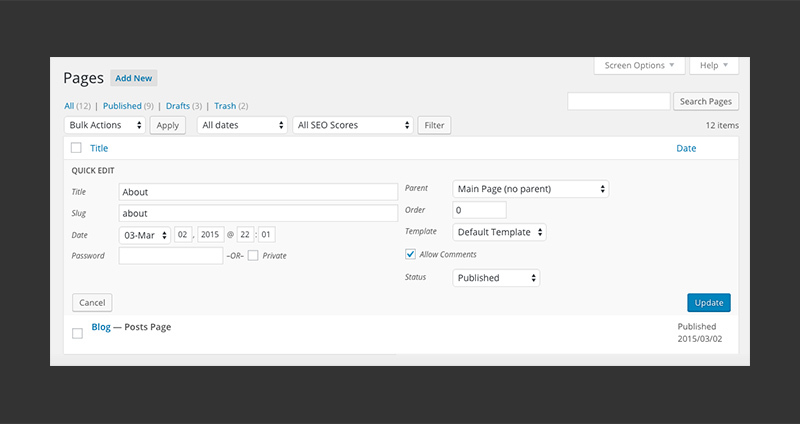 Select the checkbox next to the posts or pages that you want to update. If you want to select all posts/pages select the very first checkbox (next to Title). Find the Bulk Actions dropdown. Choose Edit, then click Apply. The bulk edit options will appear at the top of the screen. Go to town. When you’re done, click Update to save your changes. Click Cancel to abort. Since bulk edit updates multiple posts or pages at a time, it doesn’t have all the same options as quick edit. Certain fields can’t be edited for multiple posts. For example, you won’t be able to update the title or the slug of a page/post with bulk edit. If you wish to edit this fields, quick edit is your best bet. 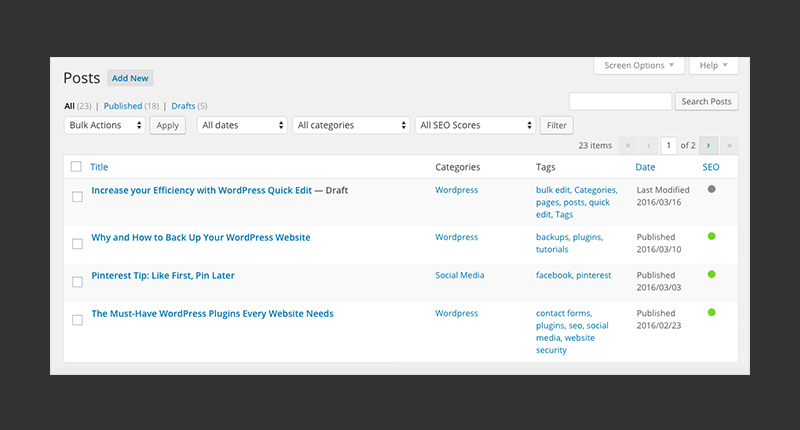 Be honest, did you know about the WordPress quick edit tool? Have you been using it to its full potential, or have you been wasting precious time?